Named Marlow Hunter's 2012 Worldwide Dealer of the Year, we are the exclusive dealer for Marlow Hunter sailboats and Marlow Mainships in Western Canada and Washington State. We are a long standing member of the marine community, offering new and pre-owned boats for sale and a full service center to meet your boating needs. For more than 50 years, experienced boaters and those new to boating have counted on Specialty Yachts to help them with their boating needs. Our customers come back, rewarding our knowledgeable and friendly staff with a loyalty that has made us the success we are today. We don't just make sales we make friends. Why Choose Marlow Hunter & Marlow Mainship? The reasons are as many as the people who buy North America's best-selling line of yachts. Marlow-Hunter is the leader in sailboat innovation and the largest North American manufacturer of sailboats. Hunters are designed to meet varied levels of experience and budget - from 15 to 50 feet, from novice to experienced, from local to offshore sailing. Our brokers are available seven days a week. Sailing in BC is a year-round activity so we believe we should be there to help you get out on the water whenever you're ready. We have proprietary systems and an extraordinary network to help you find your ideal boat or search for the ideal buyer. Specialty Yachts is a Certified Professional Yacht Brokerage (CPYB), a recognized symbol of high standards of business practice. CPYBs are recognized for setting and sustaining a benchmark of excellence in the best interests of consumers. Striving for an unparalleled level of service, Specialty Yachts is the recipient of the 2012 Marlow-Hunter Gold Service Award in recognition of the company's exceptional dedication and professionalism. 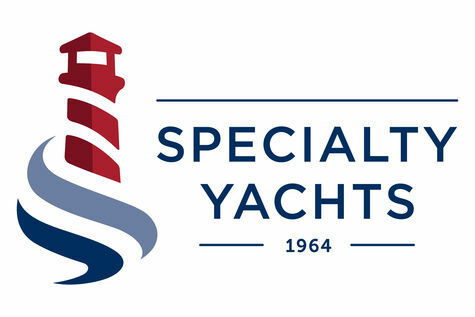 Specialty Yachts has been a recipient of this award for the last six years. Come walk our large docks on Granville Island -- the centre of recreational boating in Western Canada -- to see the latest and most popular Hunter models and high quality pre-owned sail and power boats. We believe the only way to share the boating experience is to stock the inventory that may be best suited to your needs. We also believe that our location offers the premier setting and amenities to showcase our listings. We have unobstructed views and waterways that make it convenient and attractive for passersby and those arriving from other parts of the city, the province, Canada and Washington State. Today’s fast paced lifestyle leaves few sanctuaries of solitude. Whether you are a day sailor or serious cruiser, the new Marlow Hunter 37 is designed to please. Her superior sailing characteristics are honed from her 66 predecessors to emerge from our design center. Built in the United States, she is crafted by people who understand and respect the sea. The new MH37 features a huge volume interior that offers a generous aft cabin with front and side access and en-suite head/shower. The galley has a large Corian countertop surface area, with considerable storage for longer journeys. Plus, great living areas, matching many 40 footers. The MH37 is designed to be easily managed by a couple. Traveler controls, jib sheets, and halyards are all conveniently accessed from the cockpit or helm position. Her larger main and smaller headsail combination are also easier to control. Similar to our popular 40, we’ve incorporated a hard chine in the hull shape to increase form stability while creating more interior space.